Which actions, policies, and/or approaches do you feel are the most effective in the prevention of mass atrocities in South Sudan? South Sudan is currently in conflict and represents a fragile state that has been engulfed in internal civil war since 2013. The violent conflict has enabled numerous atrocities, for example, sexual violence, including multiple and brutal gang rapes, sexual slavery, abductions, forced marriage, forced pregnancy, forced abortion, and the mutilation of sexual organs. In addition to these, there have been killings at the hands of both government forces and those belonging to the opposition, as well as the destruction of social services and amenities. Thus, security sector reform is paramount in terms of reviewing relevant legislation and engaging communities on massive awareness raising in relation to peaceful co-existence. In this sense, engagement must be made with security sector actors (i.e. army and police forces) through lobbying and pressure from civil society to review and amend South Sudanese security laws like the Police Act, South Sudan National Security Service Act, and the and Sudan People’s Liberation Act. This must be done with democratic principles and international norms in mind. Raising awareness is essential among both security actors and civilians about behavioral and attitudinal changes, as well as the cultivation of best practices. 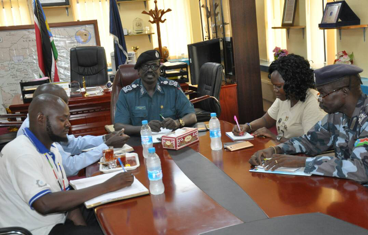 To this end, CEPO has taken steps in engaging with the South Sudan People’s Defense Force on security sector reform. Could you tell us about CEPO – South Sudan and the kind of work you do with the organization? Community Empowerment for Progress Organization –South Sudan is a vibrant and influential national-level civil society organization working in various areas such as conflict resolution and mitigation, the rule of law and human rights dynamics, gender dynamics, community policing and security sector reform. The organization is very well informed about South Sudanese societal settings, the political landscape, and overall socioeconomic development in the Republic of South Sudan. Institutional and Community Problem Solving: The joint identification of priorities related to safety and security issues, as well as the development of practical measures. Joint Responsibility Taking: The creation of local capacity and a system of joint responsibility for addressing community safety and security concerns. Platforms for Accountability: The institutionalization of a system of accountability for addressing the needs and concerns of communities while improving the delivery of police services. What do you remember as the most important element of your visit to Auschwitz-Birkenau in Poland and your time at the Lemkin Seminar? What lessons have you taken away from this experience? The module entitled “Becoming Evil: How Ordinary People Commit Genocide and Mass Atrocity.” The situation in South Sudan illustrates the quintessential characteristics of this phenomenon, as I learned at Auschwitz-Birkenau in Poland. Many of the uprisings in the South Sudan are fueled by political, economic, and/or ethnic grievances that have been exacerbated by government decisions. As a result, communities are affected by the activities of many militia groups. There are too many to mention, but a few examples can be found in the Arrow Boys, National Salvation Front, Nuer White Army, South Sudan Defense Forces, South Sudan Democratic Movement, South Sudan Federal Democratic Party, South Sudan Liberation Movement, South Sudan Patriotic Army, South Sudan United Front, Sudan People’s Defense Forces/Democratic Front, Sudan People’s Liberation Army, Sudan People’s Liberation Movement-in-Opposition, and the Tiger Faction New Forces. This cycle of conflict, which is characterized by an emphasis on revenge-based violence, has seen South Sudan witness the commission of numerous mass atrocities. What brought you to work in the field of genocide and mass atrocity prevention? Who or what inspires you in your continued work on the prevention of mass atrocities? In 2015, I joined the South Sudan National Committee for the Prevention and Punishment of the Crime of Genocide, War Crimes, Crimes Against Humanity and All Forms of Discrimination through an invitation made by a representative (and Secretary) of the South Sudan Human Rights Commission who doubles as the Committee Secretary. 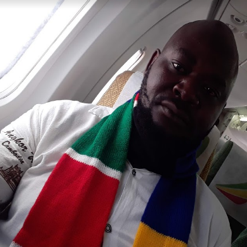 I was brought in due to my upstanding work with CEPO on lobbying for the adoption of a comprehensive Bill of Rights in the Permanent Constitution of South Sudan. Beyond this, my personal dream of “TRYING MY BEST TO MAKE OTHERS BETTER” has motivated me to continue putting effort into working with the Sudan People’s Liberation Army (now South Sudan People’s Defense Force). While this work specifically addresses individual and community safety and security concerns in Jonglei State, it can be replicated across South Sudan. The suffering of South Sudan’s women, girls, men and boys, in all aspects of life, have inspired me to continue lobbying for their betterment. I strongly believe that, if youths are emphasized and empowered positively with regard to their livelihood and given capacity through alternative education, then violent conflict would be minimized. 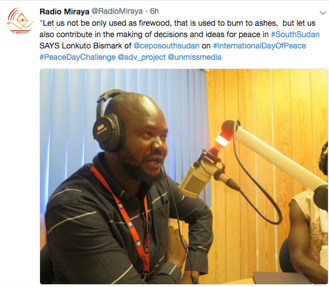 This was the message that I delivered on International Peace Day in 2018.